Could it be Heaven on Earth? 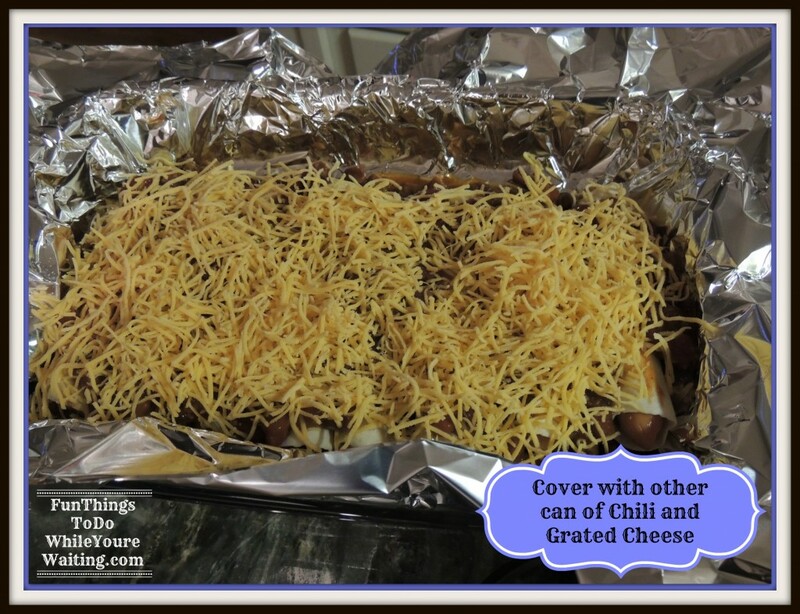 Chili Cheese Dog Casserole! I love, love, love hot dogs! I love hot dogs with all the fixings and I love hot dogs with just mayo, mustard and ketchup. I love them grilled and I love them nuked in the microwave. I just love them- regular old hot dogs- not beef franks. 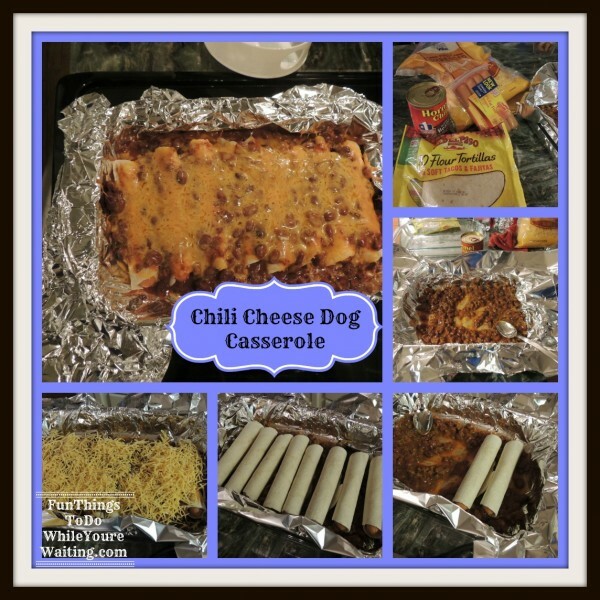 Soooooo, when the Chili Cheese Dog Casserole came to my attention on Pinterest, I knew I would someday need to be making that! And that day finally came! I was super-pumped to try this new take on one of my absolute favorites! 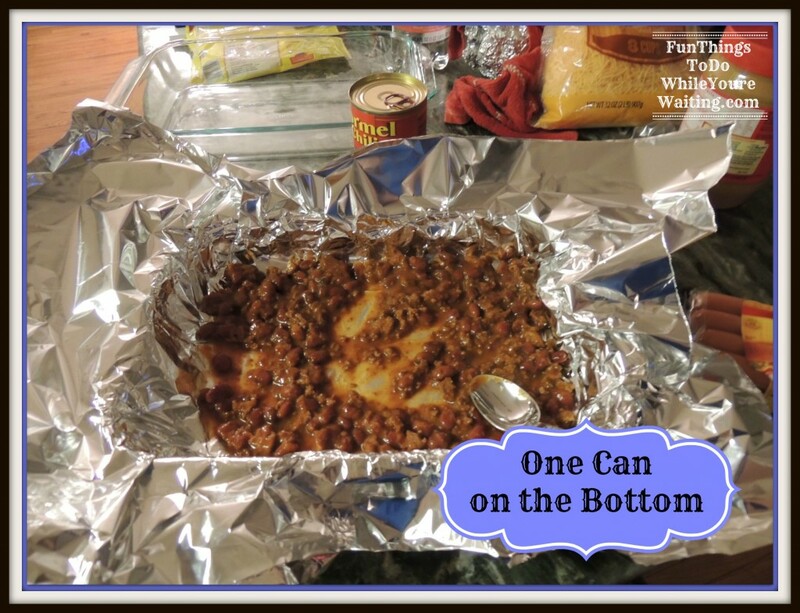 The first step is spread one can of chili on the bottom of a 9 x 13 Pyrex. Commercial Break: Do you see how I have lined the Pyrex with aluminum foil? 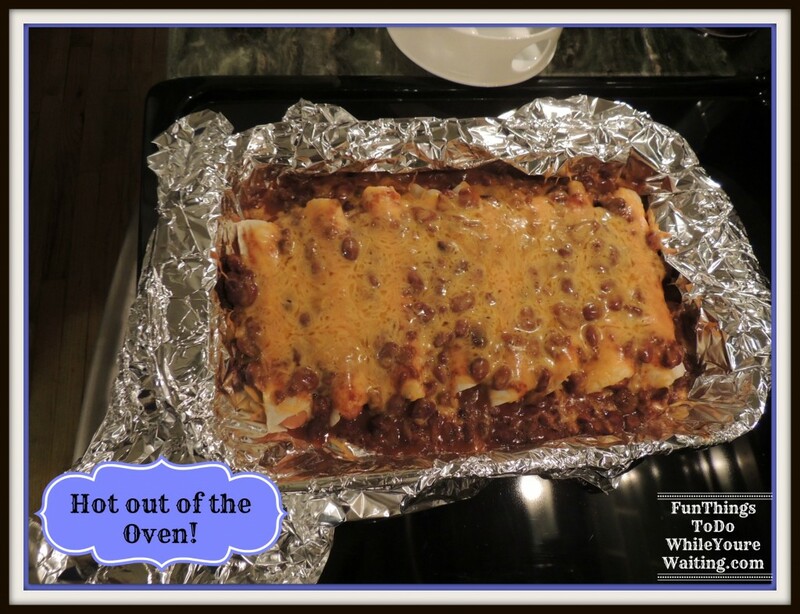 The reason being, I knew that baked on chili would be a biz-nich to get off that dish! 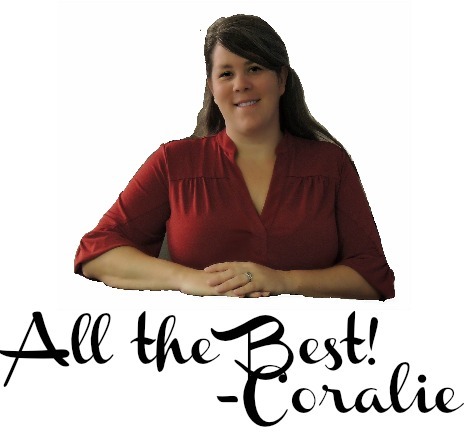 But this way, I just pull the foil out of the Pyrex and throw it and the mess away. I hate scrubbing dishes. It has crossed my mind a time or two to just throw a dish away rather than scrub it. So, it just blows my mind why this step of lining a dish with tin foil is not second nature to everybody! 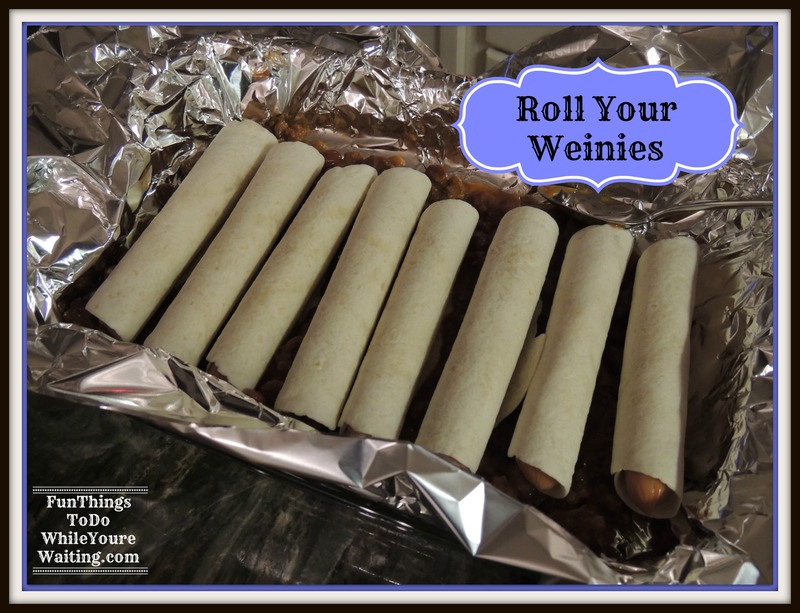 Resuming Program: Next you roll your hot dogs in the flour tortillas and lay them seem down in the Pyrex. And then cover the rolls with the other can of chili and the 2 cups of cheese on top of that. Does that not just look Heavenly? And mine looked pretty much like the original post– a good sign. Baby Bub was in bed and Bub and I sat down to dig in. Bub loves hot dogs almost as much as I so he was excited about this too. It was good but… it was not out of this world. It was good but… I’ll probably never cook this again. It was good but… we both agreed we’d rather just have our chili cheese dogs the old fashioned way- in a bun. These were very rich and a bun would help to soak up some of the richness. Plus, this recipe took more effort than making regular old chili cheese dogs- maybe I should not have tried to fix something that was not broken. Bub and I both agreed you never know until you try it. We tried it and now we know we’d rather have it the old way. Casseroles, Coralie!, The Pinterest Experiment, What's Cookin'? 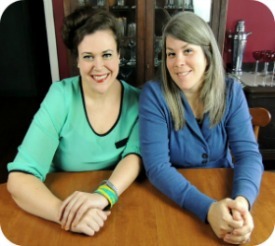 casserole, Chili, Coralie, Hot Dogs, Junk Food, Main Course, The Pinterest Experiment, What's Cookin'? Previous Article← Free Your Mind!